PROS & CONS of Keeping Australorp Chickens! March 14, 2016 April 29, 2016 - by Gold Cochin - 3 Comments. Well yet another Monday has come and it is time for us, the typesofchicken.com team to present our readers with an article about pros and cons in keeping a particular chicken breeds. Until now we have presented you articles with pros and cons about keeping the Buff Orpingtons, the Silkies and the Rhode Island Red chickens. As much as some of us want to we cannot keep our focus off those types of breeds that are usually kept in the backyard of their respected keepers or they have the capacity to be one of those types of breeds. This is why today`s article will be about the Australorp chicken breed and we at the typesofchicken.com team hope that you enjoy it. Since I got my Black Australorp I am constantly amazed on what kind of weather conditions this breed can lay eggs. This breed is very persistent in its egg laying – they can give eggs more than 250 days a year if kept properly. They give big brown colored eggs with extreme quality. Although this does not mean that you shouldn’t take proper care of them. If you want to know more about how to keep the quality of the eggs your chicken provides high, make sure you check out our previous article on what to feed your chickens to get the best eggs. 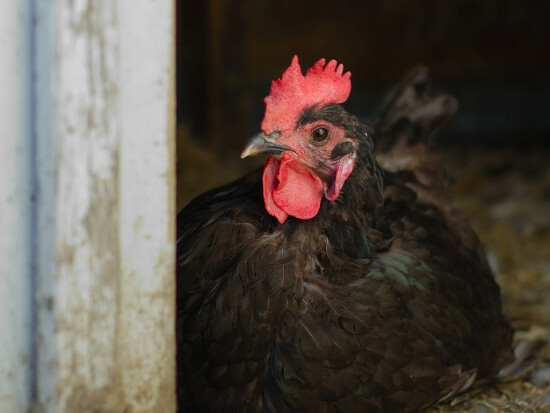 Although available bantam, in this article we at the typesofchicken.com team will focus on the regular sized Australorp chickens. 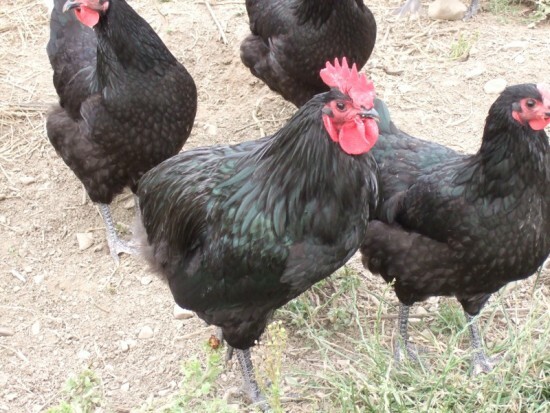 They come in 3 colors – black, white and blue – and any of those colors combined with their recognizable large and uptight single comb look the Australorp chickens are a pure sight for every chicken enthusiast – novice or professional. These attributes combined with their soft feathers and their large size are making this breed perfect for any backyard flock. Friendly towards humans and animals alike, the Australorps can be very well one of the best multipurpose chickens breed you can get. As we mentioned above they are very persistent in laying eggs in difficult weather conditions – and that – combined with their friendliness is what makes this breed almost the perfect pet. The almost in the previous sentence stands because some chicken keepers complain that the Australorps can get too heavy for children to lift and pet. Honestly, except the fact that there can be issues with color availability of this breed in the US, we at the typesofchicken.com couldn’t find any more serious issue about the Australorps that can get in to this list. Some might say that the roosters can be aggressive towards children and problematic with their arrogance we at the typesofchicken.com team agree that these can be attributes of roosters from any breed so this couldn’t be included in the list also. If you want fresh eggs daily and a pet friend for your children make sure you get one or more of the Australorp chicken breed for your backyard flock. We hope you enjoyed reading this article as we enjoyed writing it for you, until next time- the typesofchicken.com team. Next Article How to Make Your own Movable Chicken BROODER – DIY Project! I really enjoy reading the articles. I always learn so much. I grew up around chickens but want to learn so I can take good care of them. In my experience this breed is prone to broodiness. That can be a pro if you want a Hen that will hatch and raise chicks, or a con if you don’t. Is there a certain kind of rooster that needs to be used for these? For instance, does the breed need to be the same? Thanks for the good article.